Some of the most common topics discussed are to do with housekeeping and electrical. “Taking down curtains of cobwebs, properly storing piles of combustibles and putting electrical in conduit are all easy steps to improve fire safety,” says Benn. Having a no smoking policy in the barn is of course crucial. With so many combustibles in a barn (hay, dust, bedding), taking an attitude that “it won’t happen to me” is like playing Russian roulette. Where the horse owner may see a stack of neatly piled hay and a cozy tack room with a heater plugged in keeping the saddles free of mould, the fire fighter quickly spots all of your ignition sources and fuel sources and can make recommendations to reduce these risks. Storage implements, tractors and such should be stored in a separate building from hay and bedding. Fertilizer stored by hay could also cause a catastrophic event. 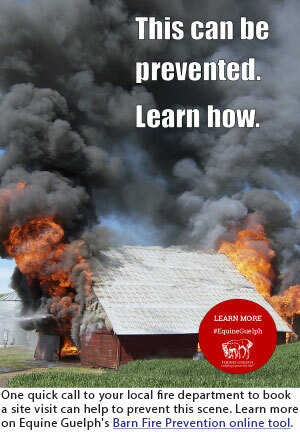 Separation to alleviate fuel and ignition sources is a best practice when it comes to barn fire prevention. There are also seasonal considerations that can increase a risk of fire. During cold months: heating/electrical systems can be taxed when drinking water freezes then thaws. Water buckets that are allowed to run dry can leave elements exposed causing bedding or other combustible material to ignite. Attempting to thaw pipes with a torch is a huge hazard. Heat trace lines provide a solution to pipes that would otherwise freeze. During harvest times improper storage of crops containing too much moisture can cause spontaneous combustion. Prior to storing hay a moisture check is important. Among the many interactive activities on the Equine Guelph Barn Fire Prevention Tool, there is a great quick reference sheet on the seven principles of life safety and barn design and a top 10 checklist for inside and outside the stable. “The big thing that was instilled in me since childhood, is to invest in your investment,” says Benn. If you look after it and it will look after you.” So don’t put off making that call for tips and a site visit from your local fire department and do make use of the great resources out there on fire safety from Ontario Ministry of Agriculture Food and Rural Affairs, Ontario Federation of Agriculture and Equine Guelph’s interactive Barn Fire Prevention online tool here.